"If your inner child is a girl, that's okay." In other reviews of the Short series, I've taken the series to task for lack of content. With volume 9, entitled Trust, Quickband remedies that Shortcoming (sorry) with a vengeance. We have over two and half hours of running time of films alone, not counting commentaries, storyboards, documentaries and other extras. To make my way through the entire disc took me nearly TEN HOURS. Most of the content ranges from very good to excellent, and thus we have a terrific bargain here. 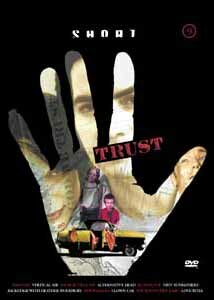 As the title indicates, the films in the narrative section focus on various aspects of trust, whether in romantic relationships, family relationships working relationships or the relationship of con man to mark. Unlike some earlier volumes in the series, this one adheres quite nicely to the theme. This 6m:41s short opens the package with a bit of broad humor, as we meet two clown, Monty and Poco (whose faces are never shown) who decide to cross a dry lake bed in their clown car, while in full regalia. Even though a clown car has infinite room, Poco couldn't fit in a spare tire, so they're left to cross the desert on foot, with only their cream pies and seltzer bottles to sustain them. The film ranges from broad comedy to poignancy and is an effective opening. According to the commentary, there are more "Clown Car" shorts to come and I look forward to them. Kevin Corrigan, a regular in indie films, is having trouble with his girlfriend, Kaylie (Jennifer Bransford, best described as a good-looking Julia Roberts who can act). He suspects that she's seeing men on the side, and arranges for a ringer to see what exactly is going on in her apartment when he's not there. This 12m:11s film is a vicious little black comedy that has done well at the Sundance festival and has reaped numerous awards. It's easily one of the best short films I've seen in this series. This short is reportedly based upon a dream that the director had. It features an intriguing pair of a nine-year-old girl and her five-year-old brother who scrape out a living by scamming customers and clerks in an urban grocery store. This 07m:05s film is alternately amusing and chilling in its look at life on the streets. This longer (17m:55s) short features Joseph and Judy, a seriously New Age couple who want to have a child, but need to borrow the money from Judy's stepfather (Cliff Bemis, best known as the IHOP spokesman), the most obnoxious right-wing bozo you'd ever want to run across (among other faux pas, he insists that the Indian restaurant where they're dining grill him a T-bone steak, with ketchup). Joseph's inner child, unfortunately, is a girl, and he keeps having to excuse himself to put on earrings and lipstick briefly. The satire is broad and takes shots at both left and right. While these are all easy targets, the film is brought off well and with style. This film is cryptic at first, centering on a middle-aged virtuoso violinist at first practicing in his room, and then taking his instrument to a back-room poker game, where he begins playing background music of one kind and another. One target after another is cleaned out by the house, until a young man enters and challenges for the purse. While the payoff is fairly predictable, it's quite an enjoyable little piece, running 14m:22s. Probably the most professional-feeling of the pieces on this disc, this lengthy Australian film (25m:47s) tells of the various reactions of members of the central character's involvement in a drug deal gone sour. Two gang members hold him at gunpoint as his brother, sister and father try to get the money the gang is demanding. The film climaxes in a lengthy car chase sequence which rivals that of most Hollywood films. Amazingly, the participants had virtually no film training whatsoever, and this was just their second film. The instinctive method of filmmaking isn't often successful, but it certainly is in this case. The epilogue is truly chilling in its use of suggestion. This intriguing little feature (02m:02s) takes propaganda newsreel footage of 1960's Red China and uses color animation overlays to give it a satiric bite. The footage of little girls sunbathing in rows evolves into an open grill in a way that is sure to elicit a chuckle. Rall's intriguing variation on the famed poem The Raven gives us black, white and red animation, rendered in a highly angular German expressionist style, combined with sweeping vertiginous motions. The animation is bold and confident, and perfectly married to the monotone narration by Paetsch. Rall doesn't stick entirely to the poem, giving it a twist that Poe himself would certainly have approved. Excellent and striking. This documentary centers on sculptor Vladimir Metani, who worked on some of the massive pieces of statuary required as icons for the communist regime of the USSR. With the fall of communism, these statues have been warehoused, and poetically, Metani makes new sculptures out of the materials, with an artistic freedom he never before had. His method of working and the history behind his work are explored in detail over 24m:56s. This black and white experimental film (the longest on the disc at 28m:19s) is the one clunker in the bunch. Entitled a composition with movements corresponding to the points of the compass, animals and concepts, it begins with a 3 minute introduction of a trumpeter playing, with a mute, in a doorway. While visually somewhat interesting, the piece goes on to a rambling disconnected series of images beginning with an Uncle Sam statue, views from a helicopter, views of a helicopter, ants, water, train stations, distorted night cityscapes of San Francisco, doodles, vegetation, a pigtailed girl, Malcolm X, sidewalks and fence shadows, skydiving, a buffalo and desert mesas. The whole exercise is tedious, self- absorbed and pretentious, and the setting to a noisy score of a live performance by Wadada Leo Smith on trumpet, with drum accompaniment, doesn't help it any. In the commentary Fenz says he knows what it means. I wish he would have given us a few clues. The disc finally concludes with an interview with Heather Woodbury, a performance artist who has come up with an epic 10-hour play featuring hundreds of characters, all of whom she plays herself. The 10m:10s short can barely give us more than a taste of Woodbury's art, but we certainly want to see more of it (the extras oblige, with an all-too-brief excerpt of one of the shows). Image Transfer Review: The image quality varies from short to short. Clown Car, Love Bites and The Raven are all clear, crisp and beautiful transfers. Sidewalkers unfortunately suffers in the transfer from its native digital video to 35mm film (both versions are presented here) as the film version loses significant detail and is overly contrasted. My Beautiful Me, Maestro and Alternative Head have significant grain and are somewhat soft. Bloodlock suffers from occasional banding, a reflection of its being shot on hi-8 videotape. I expect that all of these problems are due to the source material. Indeed, given that most of these films are made by amateurs and students, it's surprising that they look as good as they do. All films are presented fullscreen except Love Bites, The Raven and Bloodlock which are 1.85:1, and Sidewalkers and Alternative Head which comes in at 1.66:1. Audio Transfer Review: As usual, the audio is a mixed bag. The sound is surprisingly good overall, with some shortcomings. Except for the looped music, Maestro tends to have muddy sound and generally poor audio. Thankfully, only one of the many commentaries is done over the phone (for Maestro), which helps enormously in raising the average sound quality. All of the shorts have been remastered into DD 5.1, a transformation which in general has been done with subtlety and taste. Directionality is limited and generally centered on the front speakers. The lounge music which forms the theme of Love Bites comes through in a gorgeous and lush sound that forms the perfect counterpoint to the macabre goings-on in this short. The live stage show extra of "What Ever" tends to be rather noisy and hissy. Bloodlock in particular has great bass response and will do the best job of working out your subwoofer. The problems with the mains and surrounds being reversed which we reported on Short 7 do not afflict this volume, happily. Excerpt from live show "What Ever"
Extras Review: Where to begin? There are extras on extras on extras in this amazing volume. Nearly every piece has a commentary from the director (missing only from Tiny Sunbathers and Backstage with Heather Woodbury), though the commentaries to the documentary Alternative Head and the experimental film Vertical Air are neither screen-specific nor do they run the full length of the films. The commentary for Love Bites, featuring most of the cast except Corrigan, is hilarious throughout and quite excellent. Although a few commentaries tend to run towards "this is that friend, and that's my mom's couch", most of them are quite informative. On alternate angles we have the storyboards for Clown Cars and The Raven. A poster for My Beautiful Me is also featured. There is a featurette Making Love Bites which is even funnier than the commentary to the film. They conclude with a comment that their goal was to do a "Making of" that's longer than the film itself as a gratifying ego stroke; they succeed for the featurette clocks in at 13m:26s. Bloodlock not only gives us a deleted scene, but also extra footage of all the many, many things that went wrong with filming the car chase sequence. It gives one a new appreciation for the difficulty of shooting such a scene. Finally, we have a 07m:19s excerpt from Heather Woodbury's live show, What Ever. It's too short and leaves us hungry for more. Probably one of the best extras is that the forced ads that interrupted the viewing on Short 5 and 7 are gone! The only advertising is two trailers for the Warner Bros. films The Big Tease and The Whole Nine Yards and they are selectable from the menu. There are also descriptions of the contents of the DVD magazine Circuit, issues 1-6 and Short 1-8. When you combine this innovation with the incredible amount of content on this disc, you have a sure winner. As if the commentaries weren't enough, we also get extensive and informativeproduction notes on every film. Film school is open for summer! A huge accumulation of top-notch and witty short films, loaded with outstanding extras that give insight into the making of these shorts. At the incredibly low cover price, don't ask questions, just buy it!